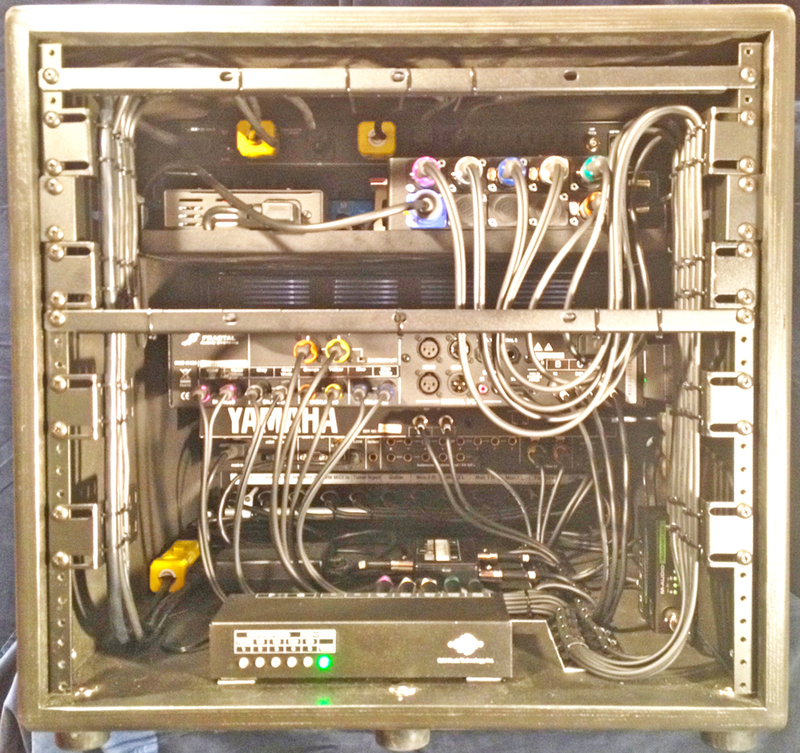 Here's a Nice Rack Canada built compact rack system comprised of the all the good stuff. Our client wanted a guitar rig for use in a home recording situation that would be infinitely forward flexible for signal path and be useable at conversation levels using full range monitoring and no traditional guitar amplification hardware. 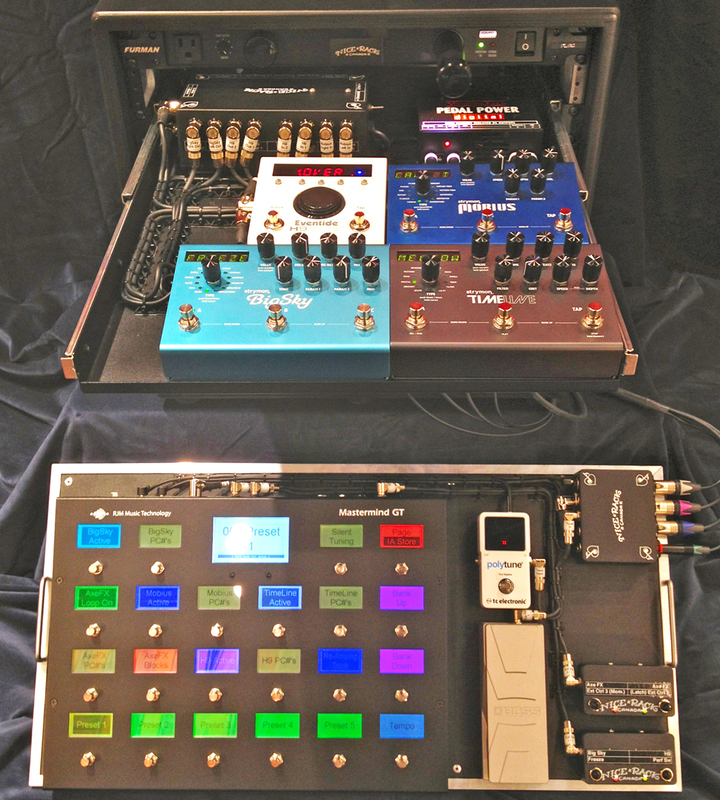 The signal flow for the system is; Guitar --> RJM Music Mini Effects Gizmo --> Send 1 --> TC Electronic PolyTune 2, Send 2 --> Re-Amping Track in MOTU 828, Send 3 & 4 --> Eventide H9 --> Fractal Audio Axe FX II XL+ In 1 --> Axe FX II XL+ Out 2 --> Strymon Mobius --> Strymon TimeLine --> BigSky --> Axe FX II XL+ In 2 --> Axe FX II XL+ Out 1 XLR --> MOTU 828 Interface & Full Mix Monitors + Axe FX II XL+ Out TS --> "Guitar" Monitors. 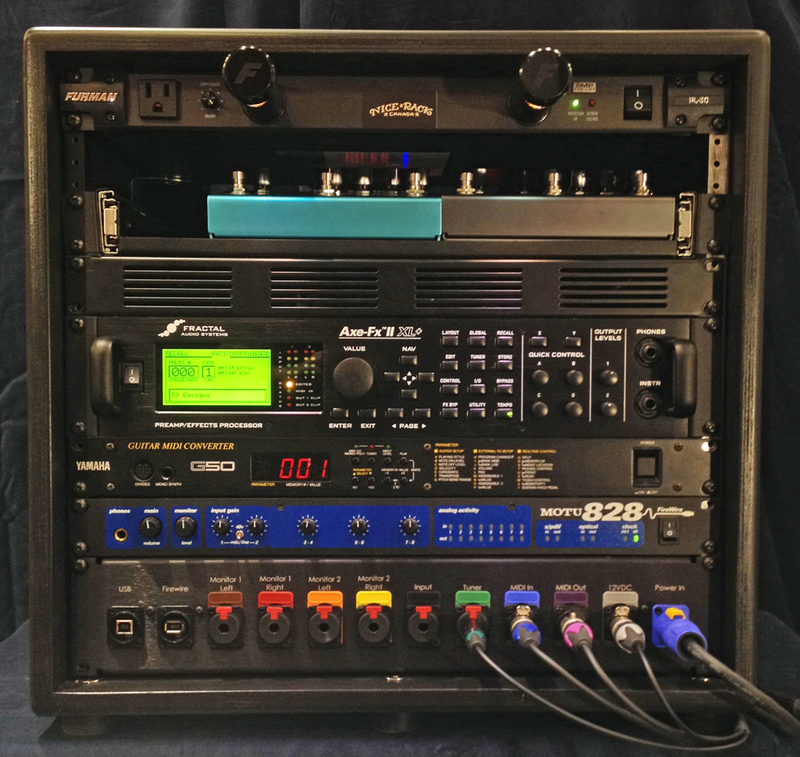 The system is controlled by the RJM Music MasterMind GT-22 with a Boss FV30L modified for expression pedal use & 4x External Switches built by Nice Rack Canada. Looping is also a key component of the user's playing style. 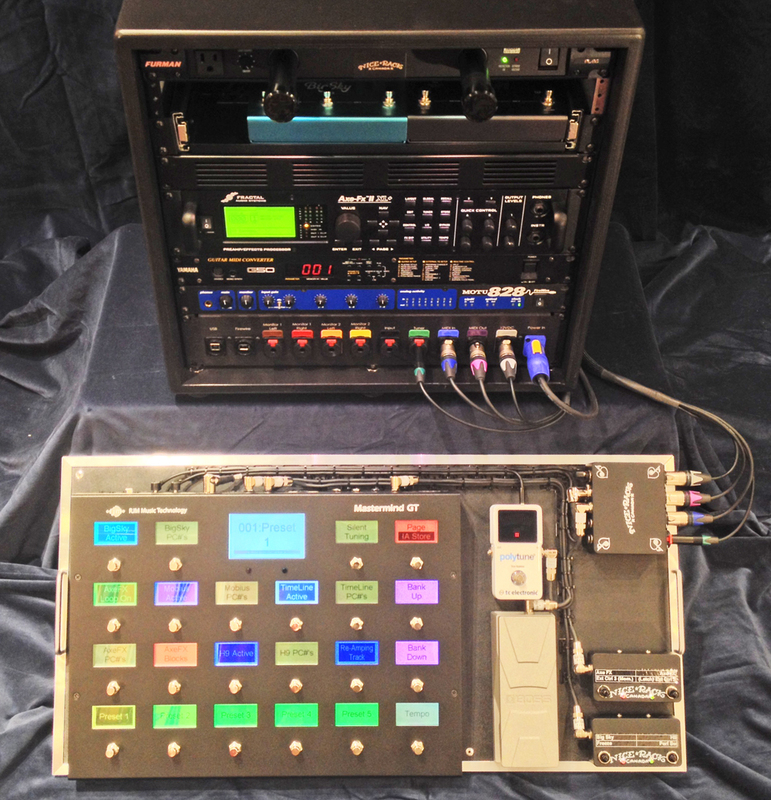 By combining the MIDI functionality of the MasterMind GT with the Axe FX II XL+, Eventide H9 & Strymon TimeLine and the signal path reconfigurability of the Axe FX the user can have 3 separate loopers in use at different points in the signal path. The Yamaha G50 MIDI Guitar Interface is mapped to Soft Synths in the DAW. 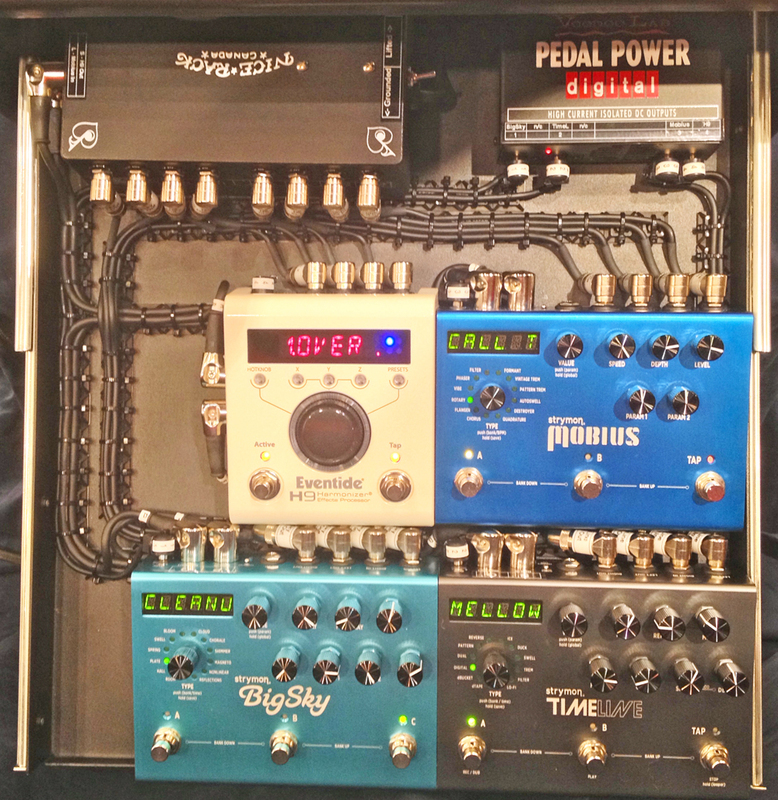 Effects pedals powered by Voodoo Lab Pedal Power Digital. Every system Nice Rack Canada builds is as unique as it's user, what is your Nice Rack Canada system going to be? Last edited by Vegas on Sun Jun 11, 2017 9:29 am, edited 2 times in total. That's really nice, nice job!! what Neutrik connector did you used for the midi application?